Please note: Customers may pre-order and buy this item now but please be aware that the earliest possible date for delivery is the 30th January 2017. 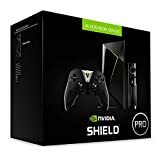 NVIDIA Shield TV Pro is the streamer for gamers. The fastest, smoothest 4K HDR video offers limitless entertainment with all the essential apps, including Amazon Video, Netflix, YouTube, Spotify and more. A streaming beast, SHIELD is 3X faster than the closest competitor. Game on GeForce Now to stream hit PC games from the cloud, instantly. Or cast your games from a GTX PC to the comfort of your living room. Control every experience with your voice-even your home. Dim the lights, order an Uber, or change the temperature, just ask. SHIELD is everything you want in one game-changing device. NVIDIA Shield TV powers the smoothest, fastest, highest-quality video and game streaming, with hands-free voice assistants to power your smart home. Movies, TV shows and games look unbelievably good with best-in-class 4K HDR or high-definition 1080p, with thousands of apps including Netflix, Amazon Video, YouTube, Spotify, Plex, Kodi, (and in your key local content apps)with more joining the line-up all the time. Expand your entertainment with the most advanced gaming of any streaming media player. Enjoy the smoothest streaming of hundreds of PC quality games with the next generation of GeForce NOWTM. Play exclusive AndroidTM games or cast your PC game library from your GeForce® GTX-powered rig to your living room in up to 4K HDR with NVIDIA GameStream. This entry was posted in Computer Hosting and tagged Home, Media, NVIDIA, Server, SHIELD by Host That. Bookmark the permalink.